Eric Hannum, who played for UH from 1996-97 and 1999-2000, now focuses his attention on his career -- president of operations and business development of a medical imaging facility. IF there is any athlete who understands mind games, it's the place-kicker in football. Almost an afterthought on the sideline, he can be a hero or a goat, depending on the whims of the wind or the fickle fingers of his holder, all in a matter of seconds. Ask Eric Hannum. Mental strength is on an even footing -- no pun intended -- with leg strength. The work ethic and mind-set that Hannum had during his playing days at Hawaii have carried over to his business. Hannum is the president of operations and business development for InVision -- a state-of-the-art medical imaging facility on South King Street, a short field-goal attempt away from Thomas Square. "The same competitive spirit that led me to be a field-goal kicker, to take a chance and come to Hawaii, led me to this," said Hannum (1996-97, '99-2000). "Having an MRI (magnetic resonance imaging) can be traumatic. I just want to provide the best possible experience for patients." To that end, Hannum turned patient, using the new 3T scanner and donning the entertainment goggles that can be tuned to live TV or DVD of choice. "Had it on ESPN, went in the tube and fell asleep," he said. 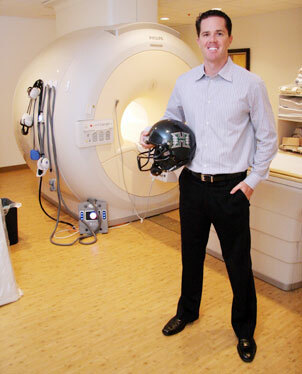 Eric Hannum stood in front of his new state-of-the-art MRI machine in his office. He's always been able to focus, to shut out the noise and distractions of life. As a place-kicker, tunnel vision was the norm, every practice and game day. Eric Hannum learned from his on-field experiences, the good and the bad, and has turned it into a business. 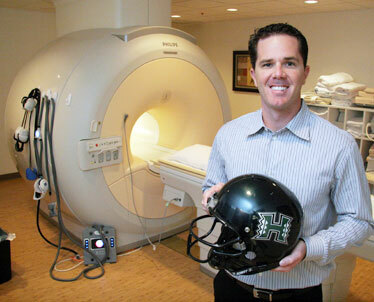 The 30-year-old former kicker/punter for Hawaii wants to make what can be a traumatic experience -- spending 90 minutes in an MRI tube -- as comfortable and stress-free as possible. Hannum, who holds a business and marketing degree from UH, jumped into the health care field about four years ago. He is now president of operations and business development for InVision, a state-of-the-art medical imaging facility in Honolulu. "I saw an opportunity where I could create something, have my hand print on everything, from location to decor to the team members I would work side by side with every day," said Hannum, who played for UH in 1996, '97, '99 and 2000. "It takes me back to my UH football days, of what you can do when you bring the right people together. "You look at 1999, June Jones' first year, where we came into the season after losing 18 in a row. That same group of guys did something special (going 9-4) and it taught me something." Hannum took over the former HPHPI facility at the corner of Victoria and South King streets, gutted it and started from scratch. Hannum said watching his dream turn into reality replicated the adrenaline rush he experienced when attempting a field goal or PAT. "Once again I was putting my neck on the line and that excited me," he said. "In football, you're either the hero or the goat. Just like kicking, I wanted to go for this. "As Teddy Roosevelt once said, 'Far better it is to dare mighty things, to win glorious triumphs, even though checkered by failure, than to take rank with those poor spirits who neither enjoy nor suffer too much, because they live in the gray twilight that knows not victory or defeat.' "
In other words, Hannum reached for the stars, going for the best there was in technology and comfort. The company's Web site calls InVision a "patient-focused, spa-like environment." The facility has a 3.0 Tesla Scanner, something not normally seen outside of a university or hospital. Films are available for patients to take with them or are online for physicians to view; there are same-day appointments with late and weekend hours; and free transportation geared to the elderly and bus riders. The best part for those with claustrophobia or panic disorders? Patients are given fully digital audio/visual goggles with choices of live TV, standard CDs and DVDs. "The 'InVision Experience' it's a tremendous tool to help patients work through anxiety," Hannum said. "When I first purchased the MRI, I wanted to be the first to go in it. I'm not a wuss, but I wanted to get out of there. The next time, with the goggles, I had ESPN on and fell asleep." Hannum fell in love with Hawaii on his recruiting trip in 1996. A graduate of the same small high school (Linfield Christian in Temecula, Calif.) as current UH kicker Dan Kelly, Hannum was originally a walk-on. "I'll never forget when Fred (then-coach vonAppen) said he was putting me on scholarship," Hannum said. "It allowed me to stay here and not burden my parents. "I knew when I came this was a special place. It's why I've chosen to stay here, to be involved in the community. It sounds cliche-ish, but it's true that it's the people who make Hawaii special. "Just playing for the University of Hawaii was an unbelievable experience, even being part of the worst-to-first record. Experiences like that have motivated me in my business decisions and mind-set. June taught us that team success is a prerequisite to personal success and the 'we before me attitude.' I think of my co-workers as my team." On the UH career lists, Hannum ranks 12th in scoring (189 points), ninth in punt average (39.91 ypk) and tied for ninth for longest punt (70 yards, 1996, vs. Wisconsin). Hannum has long been known for his involvement in the community and university, beginning with his involvement with Athletes in Action Christian group at UH. Diagnosed with Type 1 Diabetes four years ago, he is on the board of the local Juvenile Diabetes Foundation chapter, and he's also worked with high school kickers and punters. Although he didn't make the trip to New Orleans for the Sugar Bowl -- "Starting up the new business I couldn't get away," he said -- Hannum feels strongly about being part of the legacy that helped set the program back in a positive direction. His next goal? Partner with UH in meeting the needs of athletes. "UH has given me so much, opened so many doors," he said. "I want to be involved and give back."